There’s a frequent criticism of unschooling that comes from progressives, liberals, and even anarchists of various stripes, which is that, by removing children from schools, parents are hurting the schools themselves; lessening the quality of said schools (since they’re no longer involved in school improvement); and taking money away from where it’s most needed. I’ve always found this argument to be both puzzling and misguided for several reasons. Parents are unable to make a real impact on schools and how they function. Even teachers have virtually no control over the structure or curriculum found in schools, and are often left frustrated by the bureaucracy and standardization stopping them from making any significant changes, even in their own classrooms. If teachers have that little impact, than parents certainly don’t have a bigger one. Secondly, in many regions a large portion of each school’s budget comes from property taxes, meaning that schools situated in more affluent neighbourhoods will have a bigger budget, leading to more resources, more enriching activities, and at least nominally better schools. This is a true cause of inequality between schools and students, along with institutional privileges and prejudices that lead marginalized students to do worse, even in the same schools, when compared to more privileged peers. Some parents choosing to take their kids out of school, or to not send them there to begin with, are going to have a negligible impact on the finances of a single institution. To me this seems akin to deciding that, because some communities are food deserts-- areas where poor residents have no access to fresh and healthy food--everyone, no matter their finances or neighborhood access, should avoid fresh food on principle. Instead, the approach should be to recognize that inequalities exist, and start having important discussions with people in your communities about what can be done to help solve those inequalities. Start taking real steps to enact change, or support the individuals and groups who are doing said work. Whether we’re talking about food deserts or a failed education system, the proposed solution shouldn’t be to subject everyone to the same level of bad, but should instead be a search for solutions that allow everyone to have access. It seems to me that progressives have a long list of reasons not to unschool: It takes away from schools by removing parental and student involvement; there aren’t enough community resources; there isn’t enough parental support… All of these seem to hinge, not on a disagreement with the actual underlying philosophy of unschooling, but instead on the premise that the world at large and the individuals in it just aren’t ready for unschooling. I wonder if this points towards a larger problem in how progressives and anarchists attempt to solve various societal problems. Most progressives don’t actually seem to be making all that many different choices in their lives when compared to people with more mainstream political views, regardless of their economic status or the amount of support available to them. Is the issue of education just another sign of fear holding us back? Is there a widespread feeling that we just need to wait, need to focus on broad incremental change instead of radical changes made in our own lives, and those of our families and close communities? 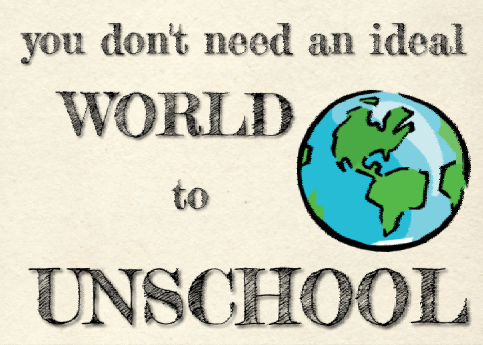 Individuals have to make the choices that are best for them, based on their unique situation, and I certainly don't believe that everyone should or has to unschool. But I also don’t think we need an ideal world to be able to make important and radically different choices about how we live and learn. Yes, to focus only on our own lives at the expense of the wider culture would be a mistake. But I don’t see why we can’t have both: a push for broader change, and choices made that are actually best for you, your families, the people you care about most, when it comes to where, or whether or not, your children go to school. We need to stop waiting for everything to be perfect to make any significant changes, or we’ll never make changes at all. I hope more progressives can stop making excuses about waiting for the ideal, and instead focus on creating something better for the children in their own lives, as well as pushing for better alternatives for all children.